Disney wants to produce more TV series and movies in Utah — but it’s looking elsewhere. Oscar nominee Taylor Sheridan would like to film his upcoming movie in Utah — but production will take place in New Mexico. BYUtv is exploring options for producing TV series in Georgia or Canada. Why? Because Utah’s tax incentive program for film and television is limited to $8.29 million a year. And compared with the demand — and the additional millions some other states provide — that’s not much to offer an industry that considers incentives a key part of the bottom line. Disney is budgeted to get Utah incentives estimated at $3.7 million for its new series “High School Musical: The Musical.” But if a pilot that Disney shot in Utah last year, “The A Girl,” gets picked up as a series, the company says it will film elsewhere, because the likelihood of Utah having several million dollars more in incentive money available is slim, due to the limited budget and other projects (including Disney’s). “Tax credits are a big driver of our decision-making,” said Susette Hsiung, executive vice president of Disney Channels Worldwide. The Motion Picture Association of Utah — where Alvarez is a board member — will lobby the upcoming Utah Legislature and Gov. Gary Herbert to provide more money for incentives. Sheridan and actor/director/producer Amy Redford said they’d do whatever they can to help make that happen. “Anything I could do that could possibly help the Legislature understand this, I'm eager to do,” Sheridan said. Utah’s incentive program is “conservative,” according to Virginia Pearce, director of the Utah Film Commission. It rebates up to 25 percent of the cost of goods and services that are bought in the state, and of the salaries of Utahns on the crew. Producers submit an estimate of how much they plan to spend in the state and — if approved — incentive money is budgeted by the Utah Film Commission. If the project doesn’t go into production, it doesn’t get anything. If it spends less than expected, it gets less — and that’s determined by a postproduction audit. Disney’s Hughes pointed out that, in 2018, Season 3 of “Andi Mack” received a $4.8 million rebate, and “The A Girl” pilot got $400,000. Those payments, combined with its estimated 2019 rebate for “High School Musical: The Musical,” are $610,000 more than the annual budget of Utah’s incentives (albeit spread over two years). “And this is just the Disney Channel,” Hughes said. “It causes us to have some tough conversations” about taking productions elsewhere. One common pushback on increasing incentives is “why would we give Hollywood people money?” Alvarez said. He finds that frustrating. Studios have to pay stars big bucks regardless of where films are produced, Redford said. The employment contracts of the crew, however, are. 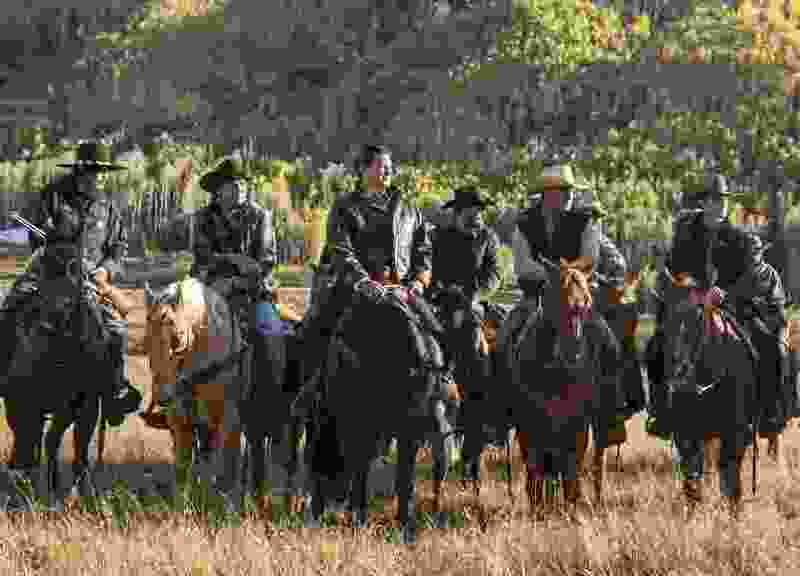 Sheridan employs up to 110 construction workers, 45 electricians and 40 drivers at a time on “Yellowstone,” which has been approved for more than $7 million in incentives in each of its first two seasons. Both that show and “Andi Mack” are receiving deferred payments, which allow the film commission to pay out incentives of more than $2 million over three years. But that still comes out of the $8.29 million budgeted annually. And that’s one of the reasons Sheridan said he can’t afford to make his upcoming film (which he’s keeping under wraps) here — incentives just aren’t available for a movie with a budget “in the $50 million range. That’s a lot of money to spend in a state,” he said. Even if only half that budget was spent in Utah, a 25 percent rebate would amount to $6.25 million — 75 percent of Utah’s annual incentives. In Utah, innumerable businesses — from the arena that’s home to the Utah Jazz to the Walmart down the street — receive some kind of tax break. Offering the same benefit to film and television productions is an investment, Redford said. According to Pearce, a recent study indicated that for every dollar spent on film incentives, $7 is added to Utah’s GDP, or gross domestic product, the value of goods and services produced within the state. The increase is generated not just by what each production spends in the state — with at least 75 percent of its budget not rebated — but by “the crew member who gets paid, who takes his wife out to dinner, who buys a new car, who is able to live and work here instead of living and working in L.A.,” Pearce said. “Yellowstone” “employs hundreds of people, and the vast majority of them are local,” Sheridan said. “And the ones who are coming in, they’re renting properties, they’re standing in line at the grocery store. They’re staying here. They’re moving in. Movies and TV shows filmed in Utah are sort of accidental advertisements. Tourists are still visiting East High more than a decade after the third and final “High School Musical” movie was released. “We’ve done some studies, and 30 percent of tourists that come to the state said that some kind of television show or movie influenced their decision,” Pearce said. Redford plans to shoot the film “Cowboys and Indians” — which she called “sort of a cultural collision between Hindus from Queens and ranchers from the southern part of Utah” — in the state this spring. There’s a reason that all the Marvel superhero movies, all the “Hunger Games” movies and a slew of TV series — including “The Walking Dead,” “MacGyver,” “Dynasty,” “Stranger Things” and, yes, “Atlanta” — film in Georgia. There’s no cap on Georgia’s incentives, which provide up to a 30 percent rebate and apply to the salaries of both Georgians and non-Georgians. In the 2017-18 fiscal year, that state paid $800 million in incentives to 455 productions, which spent $2.7 billion in the state. The governor’s office estimated a total economic impact of $9.5 billion. “Georgia’s rebate — it’s completely changed the movie business,” Sheridan. Georgia easily outspent New York ($420 million) and California ($320 million) and New Mexico ($50 million). At the other end of the spectrum, Michigan eliminated its incentives in 2015, and production there has virtually ceased. But Utah’s conservative approach looks good compared with what’s happened in New Mexico. Netflix has purchased a production studio in Albuquerque that is expected to bring 1,000 jobs — with help from $14.5 million in tax incentives from the city and the state. Utah also competes with the U.K., Australia and New Zealand. Between the provinces and its federal government, Canada alone distributed more than half a billion dollars in incentives last year, a figure Pearce doesn’t ever see Utah approaching. “I don’t think it makes sense for a state our size and the diverse economy that we’ve built up,” she said. “Aside from clogging up some traffic in spots, I don’t know the negatives. And I think the positives greatly outweigh that,” Sheridan said. “All we do is run around and just leave a trail of money behind us. Productions don’t leave “any residual trash or any toxic waste to clean up or anything,” Alvarez agreed. Another benefit to expanding incentives and the industry in Utah, he added, is keeping talented young Utahns home. He’s carved out a 30-year career as a director/producer working mainly in Utah. But he’s the exception. Sheridan would like to see rebates upped to 30 percent and the cap removed. And he’d like to see incentives applied to above-the-line costs (cast, stunt performers, producers) as well as below-the-line (goods and crew members). Redford suggests greater incentives for shooting in “economically challenged areas” and a bump for using local music talent “so you can turn these really talented young musicians into composers and writers.” She also like the idea of an expat program, which would allow people born and raised in Utah to qualify for incentives even if they left the state to find work elsewhere. Alvarez, too, wants Utah to make a bigger commitment. “It’s like you’re dabbling in it and you have this small incentive, but it’s not enough to make a real impact,” he said. “I feel like it’s a half-measure that we’re stuck with right now."